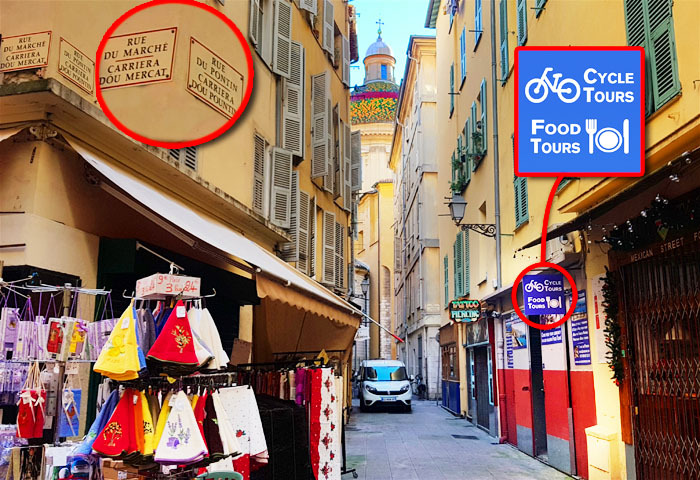 The meeting point is our shop on 1 rue du Pontin in the Old Town of Nice, see picture above and map below. Our shop is in a pedestrian zone. Please turn up on time, as the tour may start without you! Call us on +33 9 86 65 75 17 if you have trouble finding it. Most cruise passengers come to shore at the port of Villefranche, which is 6 km (4 miles) east from the city of Nice and the tour start point. Allow 1 hr 15 min for the journey. The best, cheapest and fastest way to get to Nice from Villefranche is by bus. The bus costs 1,50 € per person per ride and takes approx. 15 mins. Take the bus number 81 or 100. You'll find timetables here. Get off the bus in the port of Nice and walk to our shop (see above). Please allow ample time for driving into Nice and finding the car park - traffic can be quite dense! Exit the motorway at exit 51 - Airport Nice Côte d'Azur. Follow signs for Nice-Centre and then Promenade des Anglais. Complete driving directions here. Exit the motorway at exit 50 - Nice-Promenade-des-Anglais. Follow signs for Promenade des Anglais. Driving directions here. Once on the Promenade des Anglais (a large palm-lined boulevard with the airport, then the sea, on the right), follow it for 6 km. After leaving Hotel Méridien and McDonald's on your left, turn left following signs for Vieux Nice (Old Nice) and Parking. There are four multi-story car parks available in the old town: Sulzer, Corvésy, Palais de Justice and Cours Saleya. Follow signs for Sulzer, as it's the most convenient. Walk from the car park to our shop (see above). Cannes is 30 km (18 miles) to the south-west of Nice, Antibes is 17 km (11 miles) in the same direction and Monaco is 13 km (8 miles) east of Nice. 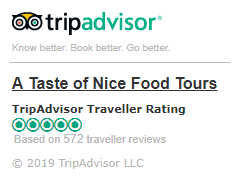 From either of these, the fastest way to get to Nice is by train (Cannes 40 min, Antibes 30min, Monaco 25min), although this leaves you with a 20-25min walk (1.8 km, 1.1 miles) from the train station in Nice to our meeting point, (although you can also grab the tram to shorten the walk somewhat). Get off at the Nice-Ville station. With the train station behind you, turn left and walk out to the main thoroughfare, the Avenue Jean Médecin. Turn right and follow it all the way down to a very large square with a large Apollo statue at its far/south end. Alternatively, grab the tram (1,50 € per trip per person) from the "Gare Thiers" stop for two stops and get off at the "Opéra Vieille Ville" (Old Town Opera) stop. From here, navigate to our shop (see above).